Description: Quite simply the best! 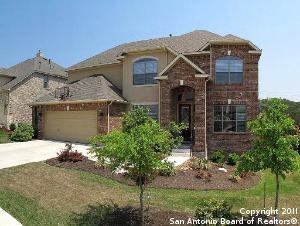 Put on the ritz: best floor plan for entertaining & livng w/ all the upgrades on greenbelt! Downstairs master retreat! Wrought iron stairway! Outside living room with fireplace & views! Media room is 5th bed! Walking distance to lazy river and neighborhood pool! Distressed cabinets w/drawers, top of the line stainless appliances, gas cooktop, convection oven, granite & deep sink in island! 3 car tandem garage plus 5 ft extended sides! Surround sound! Upgraded lighting thru out! Wow!